Yesterday we talked to you about how much we love Michelle Williams and her vintage-inspired style. We showed you some of our favorites of her red carpet looks in which she wore current designers who have heavy retro influence in their collections. 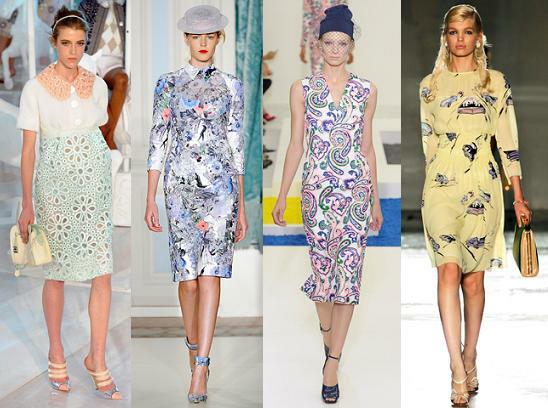 Today we want to gush over such designers who have been bringing a mid-century ladylike appearance back into style. Now, we know the Fall 2012 shows are walking right now, but let’s just focus on the present, and talk about this spring, shall we? We’re back today with another scarf tutorial! This has been a popular year for turbans and head-wraps among the trendy. We have seen a lot of wonderful how-to’s out there for basic, easy, turban-inspired styles. Rather than give you a repeat, today we’d like to show you a more complicated trick – a full turban with a rosette on the side! This look takes a little practice to perfect, but the effort is worth it. Use a long rectangle scarf for this, or a large square folded over into a triangle. Put the middle of the folded edge of the triangle (or the middle of the rectangle) at your forehead, with the point at your back. Leaving the middle corner loose, take the other two corners and tie them on one side of your head. Tuck and fold the back in neatly! Now double that tie on the side to make a knot. Take the smaller end of the tie and twist it. Wrap the twist around the other end of the tie, and around the knot in a spiral, tucking the end into the knot. Repeat with the other tie, tucking in well. Adjust, and enjoy your gorgeous little turban! For this technique we liked the softer colors of our ‘Alice’ scarf – a silk/rayon blend from the 1950’s, patterned with puffs of thistle colored flowers. 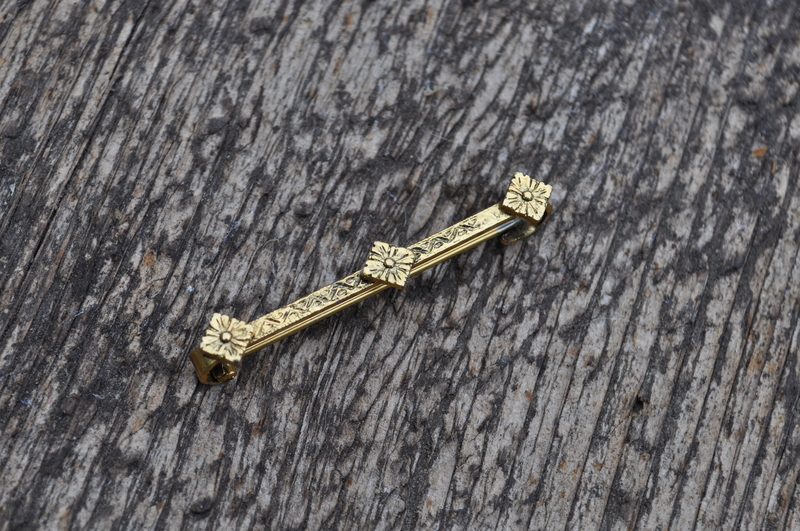 Another new piece added to the shop this morning – the tiniest little bar pin with three simple flowers. The littlest details in an outfit can say a lot, and this is just the perfect pin to add interest without overpowering the rest of your look. A bigger statement could also be made by grouping this little brooch with clusters of tiny scatter pins for an effect that is truly one-of-a-kind. Another new item added to our shop today! 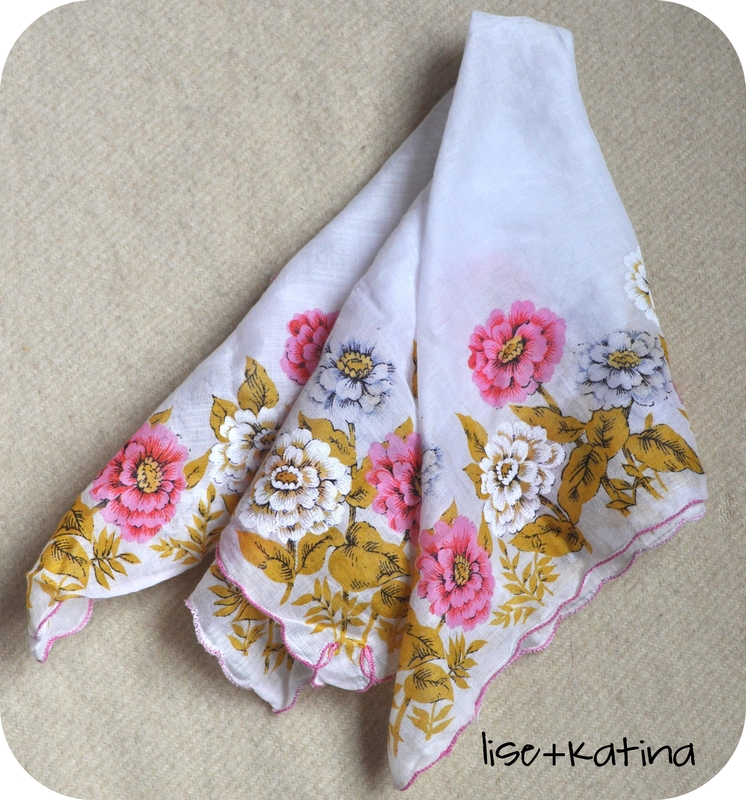 A lovely little handkerchief with a pretty floral print. 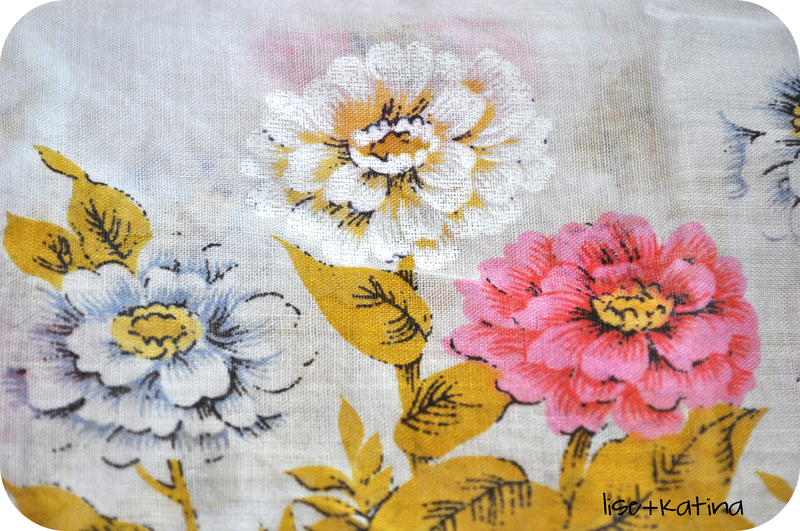 We find vintage handkerchiefs everywhere we go, but coming across ones that are both in perfect condition and have truly interesting details happens much less frequently. We love having lots of old-fashioned hankies around the house for creating spontaneous vignettes, tucking into our pockets, or using for craft projects. A few of our fav DIYs from the web: Save the dates, handkerchief pillow, this elegantly scattered table runner, and this why-didn’t-we-think-of-that easy art wall. If you use one of our hankies for a DIY project, we would love to see the result! Please email us your photos!